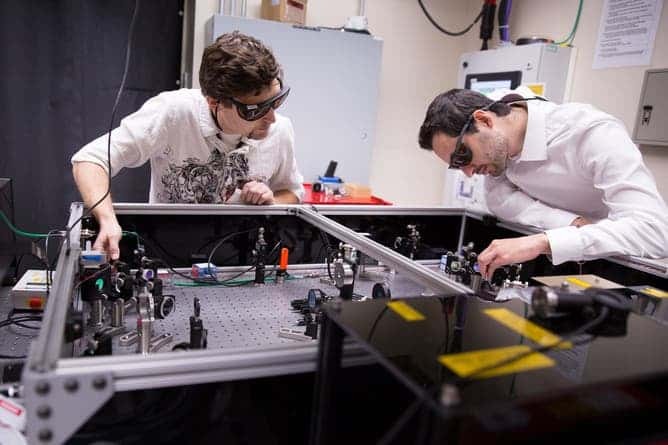 Researchers at the SLAC National Accelerator Laboratory have devised a particle accelerator that can increase the kinetic energy of particles passing through it hundreds of times faster than the LHC. While the latter is comprised of a 27km ring, the device made by the US scientists is only 30cm in size. This massive leap in miniaturization could drastically reduce the cost of bulky and expensive medical devices like X-rays, lasers or radiotherapy. Some of these sell for more than a million dollars, and a big chunk of the cost and storage size is reserved to the particle accelerators. Particle accelerators transfer energy so that protons, electrons or positrons (anti-electron) can reach ever higher energies. When these particles are collided at these tremendous speeds, funny things start to happen. If billions of collisions are made, chances have it that all sorts of elementary particles, some lasting only a fraction of a second, can be seen. This is how the famed Higgs boson was confirmed at CERN only a few years ago. In a way, a high-energy particle accelerator like the LHC at CERN is a time machine, because it replicates conditions similar to those in place mere moments following the Big Bang. Now, the LHC is a lot different than smaller particle accelerators like those used in medicine. For one, the LHC accelerates hadrons (protons, neutrons and subatomic particles) in a huge energy flux (luminosity) by “rf cavities” – a sort of black box that transfers electromagnetic energy into the kinetic energy of particles, accelerating them. Multiple such cavities are used, but they have to be carefully placed to avoid lightning-like discharges of energy.This is mainly why the LHC needs such a large accelerating ring. Other applications, however, don’t require a high luminosity. In medicine, particle accelerators use electrons (instead of hadrons) and don’t require high luminosity, which is helpful to generate multiple collisions. Instead of rf cavities, the accelerator made SLAC uses a short column of lithium vapour “plasma” in rapid succession, whose electric field is able to transport energy to electrons hundreds of times faster than the LHC – all with a device 30cm in size. Plasma is considered the fourth state of matter. Plasma is a cloud of protons, neutrons and electrons where all the electrons have come loose from their respective molecules and atoms, giving the plasma the ability to act as a whole rather than as a bunch of atoms. A plasma is more like a gas than any of the other states of matter because the atoms are not in constant contact with each other, but it behaves differently from a gas. Between particles in plasma, the electric field can be very high and as electrons pass through the plasma in the SLAC experiment, they acquire energy. So, how could this translate into practical applications? Well, the prime candidate, as already mentioned, is the field of medicine. Handheld particle weapons might also be possible. Whatever we’ll see happening, the LHC won’t become obsolete any time soon. On the contrary, ever bigger hadron accelerators are being considered, like the 100 TeV machine in China.